Shows are at 10am and 11.30am with additional shows at 1.30pm on Mon 24, Fri 28 and Sat 29. Tix are $24.90 each plus booking fee. Just don't try these techniques in public, 'kay? *Or, 'How this works is a mystery'. "Sweeney Todd Biomedical Waste Disposal"
Stardust! I was lucky enough to see a preview screening yesterday and I can report back that it's great! It's not perfect, but if I started down that road you'd all say I was being picky, and there'd be cries of "Spoiler! Spoiler!" and then you'd want my head on a pike or something and I do prefer my head where it is so, yes. Stardust. It opens (in Australia) on September 20. Go see it! In fact I might even see it again and write a proper review. Maybe. Following on from yesterday's Youtube find, Alex points out that Typography School is also a pretty excellent short film. I agree. I'd like to think it's the kind I would have made had I been better dedicated to, or indeed, any good at film school. One for the steampunk and typography fans. Abbey is growing so fast - it's all eat and sleep with her at the moment - that today she managed to stub the same toe four times. Of course each time she did so she set off a wail akin to an air-raid siren. Kids aren't supposed to yell like that after the age of two. Really. Her lungs are so much bigger now it's damaging my hearing. It's life, but not as we know it. I'm slowly rewatching all of Star Trek: TNG at the moment to shore up my nerd-cred. Last night it was Home Soil - The Enterprise discovers intelligent inorganic life on a plant about to be terraformed - and I wake up this morning to this! Intriguing new evidence of life-like structures that form from inorganic substances in space are revealed today in the New Journal of Physics. The findings hint at the possibility that life beyond earth may not necessarily use carbon-based molecules as its building blocks. "These complex, self-organized plasma structures exhibit all the necessary properties to qualify them as candidates for inorganic living matter," says Tsytovich, "they are autonomous, they reproduce and they evolve". Press release. Paper at New Journal of Physics. But can it be accurately represented by a little glowy light in a bell jar? They tried to do me in today. I was scouting around the floor, looking for where they were getting in. One drops onto my head. I look up. They are pouring in through the skylight just like extras in a horror film and half of them are the flying kind and they're getting in my hair and stuck in the fibres of my woolly jumper. I spray and spray and oops, cover the fishtank, and spray and spray and I swear they are attacking me. The chemical smell is unbearable. We escape to the supermarket. Something is tickling the back of my neck. It's my jumper. It's my hair. It's psychological. We're in the vegetable department and something psychological is biting my arm. I scramble. I itch. I pinch tiny ant bodies from underneath my clothing. People are looking at me strangely. More strangely than usual. We return home. The floor is littered with corpses. Abbey and I were lucky enough to be at a Japanese friend's house at lunchtime today. We didn't do it on purpose, but all the kids were having fun playing and she just asked if we'd like to stay. Half an hour later we sat down to yakisoba, onigiri, garlic bread (not sure about the Japanese relationship to that one), steamed rice with natto and grated daikon, and botamochi with tea to finish. All made on the spot too (except the botamochi which was purchased). I've never seen such speed in a kitchen before. Particularly impressive considering the four under-four-year-olds that were underfoot. It was all excellent, even allowing for the bonus points automatically given to any meal I don't have to prepare. Say what you like about acquired tastes. Compare it all you want to to Vegemite and blue cheese. This stuff is disgusting. Firstly the smell. It smells like a gnu with halitosis. Then there's the texture. The brown fermented soybeans are about the size of two grains of rice (or a guinea pig's faeces) and are coated in a light brown slime that is both sticky and slippery. The natto is stirred with soy sauce before serving with plain rice. I'm so glad our host warned us about this dish before I tucked in, but I'm a brave guest and I took a tiny bit. I should've known from the twinkle in the chef's eye that this was going to be interesting. So imagine this - bad smell, a slightly crunchy texture that is at the same time sticking to your chopsticks and difficult to pick up. Now chew. The taste is initially of something that's gone off. There's a slight saltiness, but I didn't get the "cheesiness" that others say they can taste. Now, I like eating weird stuff, but for preserved foods I really need the acid taste of a pickling agent - like vinegar. If natto had that sour hit it might have been OK. Without it my instincts say, "This food will make you ill."
If I ever want to revisit this experience I will scrape some of the scunge off the bottom of a wheelie bin. Thank god the garlic bread was there. I've just discovered that Nothing Rhymes with Rachel is now syndicated through Livejournal. Many thanks to whoever set this up! Here is the link you'll need to add mechcat to your lj friends page. The full text of the letter sent by Angus and Robertson, where they demand $2,500 to $100,000 to cover the gap created by an "unacceptable level of profitability" from small to mid-sized Australian publishers, has been posted online, along with a brilliant response from Michael Rakusin, director of Tower Books. While one may be forgiven for believing that Angus & Robertson is actually a company purveying "Sale" signs, I do believe you are still in the book business? Jane Espenson has an explanation of why certain fantasy and sci-fi stories cross into popular acceptance, and others do not. It's a very specific type of Hero's Journey, the most potent sub-case. It's told over and over again, and it works, over and over again. Dorothy Gale, Buffy Summers, Harry Potter, Charlie Bucket, Luke Skywalker, even Peter Parker, they all fit a very specific pattern. They're living a life, sometimes a fine one, often a troubled one, but certainly one governed by ordinary rules, when suddenly the curtain is pulled back and a whole new world, or a new set of rules of this world, is revealed. And what's more - and this is the important part - in that new world, they are something special. They are The Chosen One. It also goes a little way to explain the current popularity of YA fiction among adults. In a world where so much is going wrong, wouldn't it be great to have the opportunity, ability and belief from others that you can make a difference? Yes, please. 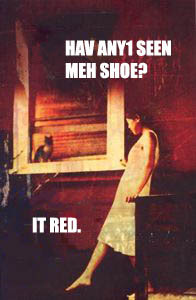 As part of their guest bloggery over at inside-a-dog, Justine Larbelestier and Scott Westerfeld held a lolcat contest. That's my entry there, second from the top in the list-o-winners!